Homesaver may be the best known brand of chimney liner for several reasons. They offer a large selection of liners for all applications in many sizes and shapes. The "Ultra-Pro" is in our opinion the best quality light style liners in the industry. They dont require a wrestling match to un-coil and every other liner we have seen can kink or dent just trying to get it straight. It is also the most flexible off all the liners we offer making a couple extra dollars save hours on an install if not making the impossible, possible! If you have bends, or an offset appliance, or tight fitting application, go with this liner. It is also the most crush resistant light liner around. Homesaver Ultra-Pro/Pro - High performance light weight liners. RoundFlex - Premium heavy weight liner. OvalFlex - Ovalized premium heavy liner. 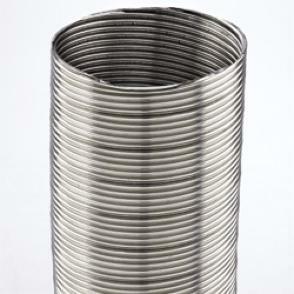 RectangleFlex - Heavy weight liner made for 8"x12" flues. FireplaceFlex - Heavy Weight liner for large flue re-lining. Dial-A-Flex - Heavy weight liner custom ordered in 94 square/rectangle sizes. Prices are for kits with no insulation package. Please read our F.A.Q. for the importance of a properly insulated linner. All items ship directly from the warehouse and are usually delivered in three to four business days.